Water flushes out from under the tires that roll south through Arroyo Grande Creek toward a wall of sand stacked 4 to 6 feet high on the other side. Nick Lalanne hits the gas pedal of his white Chevy to motor up the bank and park, overlooking something that hasn’t happened in several years. The Pacific Ocean’s tide laps into the creek with every wave, and fresh water runs head-on into salt water. It’s the last weekend in January and the Oceano Dunes State Vehicular Recreational Area is now open after being closed to motorized access for nearly a week. The last of the month’s storm surges coincided with king tides—the very highest tides—and the creek was too deep and dangerous to cross. POUNDING SAND: ATV riders drive around on one of the hills in the Oceano Dunes State Vehicular Recreation Area on Jan. 28. Dust carried by the wind up to the Arroyo Grande/Nipomo Mesa is one of the issues that has plagued the state park. But it was opened earlier in the week, and weekend warriors are lined up watching others take the foot-deep watery dare. An SUV hauling a trailer of ATVs is going for it as a wave hits the sand, pushing into the creek, quickly and momentarily doubling and tripling how deep it is. The driver flips a U-turn at the last minute, narrowly avoiding the damage that saltwater can do. This creek that occasionally finds its way to the ocean is a troublemaker. It’s constantly changing and has pushed many vehicles—and their drivers—past their limits. 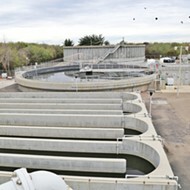 It can be a lifeline for fish (such as steelhead) to make their own crossing, from fresh water to salt water and vice versa. It has been a touchstone in the environmental argument against driving on this stretch of beach and into the dunes—an example, some activists say, of how the state Department of Parks and Recreation Off-Highway Vehicle Division flagrantly flouts laws like the Endangered Species Act. Arroyo Grande Creek’s penchant for stirring things up was evident on Jan. 12, during a California Coastal Commission review of the Oceano Dunes’ coastal development permit. The permit dates back to 1982, was updated in 2001, and the park has complied with some but not all of the terms outlined in the agreement. One of the sticking points is the creek: Should people be able to drive through it when it’s flowing out to sea, which is a rarity? The answer depends on the person. It’s a concern lined out in the Coastal Commission staff report that was presented at the review. The creek supports populations of two species that are listed as endangered under the Endangered Species Act, steelhead and tidewater goby. Lucia Casalinuovo, a Nipomo Mesa resident who’s outspoken in her dislike of vehicles on the dunes, made an impassioned plea to coastal commissioners on Jan. 12 during public comment on the issue. She capped off her minutes on the microphone with video footage of a Suzuki Samurai crawling up a 6-foot bank east of where the Arroyo Grande Creek crossing is supposed to be—on the wrong side of a set of wooden posts with signs clearly stating that no vehicles are allowed past the invisible line. Lalanne, who’s spent half his life visiting the dunes and believes people should follow the rules, was sitting in the audience at the time. “That’s illegal,” he half-whispered in exasperation. Drivers heading out to enjoy the dunes have to cross that creek, if it’s running. The creek is about half a mile from the closest park entrance on Pier Avenue in Oceano, and it’s the only way in and out of the recreation area. Still, commissioners were frustrated that state parks hasn’t figured out a way to get vehicles to the dunes that doesn’t involve driving through the water. Shallenberger has served on the commission long enough to know this whole Oceano Dunes permit compliance issue has survived through at least three different state parks administrations. The current administration wasn’t around the last time this item showed up before the Coastal Commission in February 2015. PLAY TIME: A Ford Ranger completes a small jump off one of the hills at the Oceano Dunes State Vehicular Recreation Area on Jan. 28. 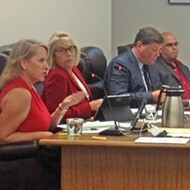 The State Department of Parks and Recreation was unable to respond to questions from New Times before press time, however, representatives of state parks spoke briefly at the recent commission hearing. They indicated state parks was looking forward to continuing a positive working relationship with commission staff to resolve some of the outstanding compliance issues. The creek battle is just a microcosm of the fight over the Oceano Dunes. Although there are the off-road enthusiasts, environmentalists, residents, and politicians squared off and firmly entrenched in their opinions of how the park should be run, the permit compliance issues have put some state agencies in the position of policing the Department of Parks and Recreation. Compliance issues include designating a permanent staging area from which vehicles can enter the beach. The entrances off West Grand Avenue in Grover Beach and Pier Avenue in Oceano are considered to be interim staging areas under the current permit. However, state parks considers those to be permanent staging areas because they’ve been developed and in use for the past 35 years. The Coastal Commission disagrees. There are allegations that the Oceano Dunes sometimes violates the vehicle use limits of 4,300 vehicles per day; that signs designating areas as not for vehicular use have been removed; and that vehicles drive through Arroyo Grande Creek, damaging sensitive habitat. However, the staff report concedes that commission staff hasn’t been able to verify or discount the allegations. The commission, the U.S. Fish and Wildlife Service, and the National Oceanic and Atmospheric Association are still waiting for the first draft of a Habitat Conservation Plan (HCP) that state parks was supposed to complete as part of the 2001 permit update. Among other things, the HCP would cover how the Oceano Dunes plans to manage endangered species as well as mitigate for and minimize “takes” (deaths, harassment) of listed species such as the Western snowy plover, least hern, steelhead, and tidewater goby. In 2016, the Oceano Dunes reported six snowy plover takes to the Fish and Wildlife Service. Three were reported in March and three in November. All were found dead in vehicle tire tracks on the beach, according to two letters that were included in the recent commission staff report. HELPING HAND: Nick Lalanne helps Cesar Vejar, 20, from Ojai load his broken bike into the back of Lalanne’s truck on Jan. 28. Lalanne said it’s part of the way things work out on the dunes—people help each other out. In each of the letters, Fish and Wildlife tells the Oceano Dunes that it’s out of compliance with the Endangered Species Act, that certain mitigation actions need to be taken, and that completing the HCP would help the park get into compliance with the Endangered Species Act. 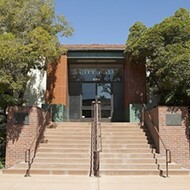 Ashley Spratt, a spokesperson with Fish and Wildlife’s Ventura office, said the agency hasn’t taken any enforcement actions yet and is working with state parks to get the HCP completed. Plover deaths aside, all the agencies involved agree that the Oceano Dunes has an excellent snowy plover nesting program—with 1.5 hatchlings fledged per breeding pair, exceeding the program’s goal of at least one fledgling per pair. Since 2001, the permit compliance issues have been reviewed by the Coastal Commission on eight separate occasions, including in February of 2015, when the conversation was similar to—but hours longer than—the discussion that took place during the recent permit review. At that time, state parks and the commission vowed to work together to make progress. Brent Marshall, who was then in charge of the Oceano Dunes, promised a draft of the HCP by the end of 2015. 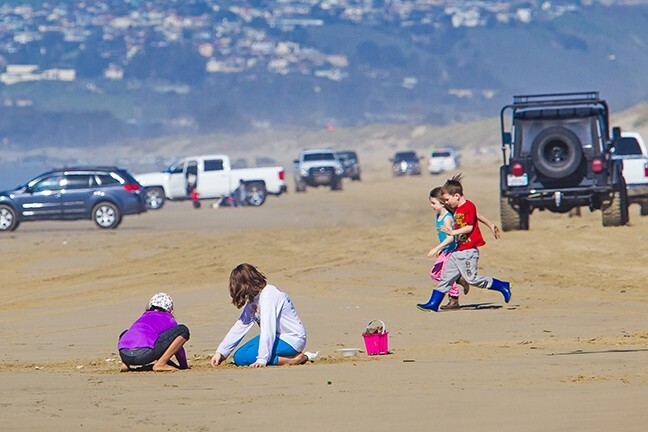 SAND, SUN, VEHICLES: Children play on the strip of beach between Pier Avenue and Arroyo Grande Creek, the sandy road that takes drivers to the 1,500 acres of Oceano Dunes that are available for off-road recreation and camping. 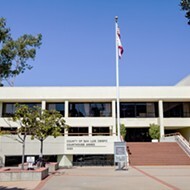 According to commission spokesperson Noaki Schwartz, state parks and Coastal Commission staff have met since the January 2016 meeting and more meetings are planned for the future. The Oceano Dunes totals about 3,600 acres, and 1,500 of those are open seasonally to camping, day use, and off-highway vehicle recreation. Campsites cost $10, which you can’t find anywhere in California, especially on the beach. Day use fees are $5. 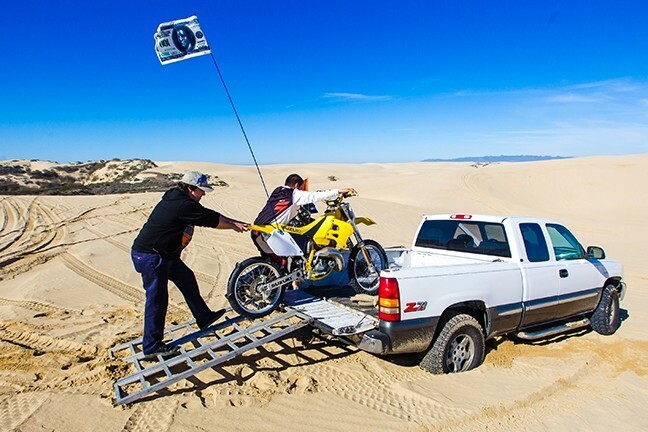 Approximately 1.6 million people and 136,000 off-highway vehicles recreated on the Oceano Dunes in 2015. State park rangers responded to 254 accidents, four of which resulted in fatalities, according to data provided by state parks. Lalanne, who has a season pass to the Oceano Dunes and recreates there several times a week, helped facilitate the response of emergency services to some of those accidents. He knows where he’s going and what he’s doing on the undulating sand-covered expanse, and like many of his fellow riders, he says he’s happy to help anyone who needs it. A year and a half ago, he started the Pismo Dune Riders Facebook group, which now has more than 6,000 members. Pulling between two dunes on the last weekend in January, he exclaims that things look different than they did the week before. He’s driving to what activists and the Coastal Commission point to as a potential alternative staging area to the Grand Avenue and Pier Avenue entrances. It’s a road that’s gated at the Phillips 66 property line, southeast of the beach at the bottom of a dune valley. He drove in the “easy way,” and is driving out the “hard way,” as he explains it. The way in was bumpy and roundabout—not a straight shot. Soft sand and a steep hill await the departure. He floors it just enough to get up to speed and crest the hill. Not too fast or too slow; it has to be done just right. His eight-cylinder Chevy with a motorbike in the back and four passengers has no problem getting out of the hole where the gate was. The road came up at the Jan. 12 review, and is something some people say could be a potentially permanent staging area from which to enter the dunes. For one, you wouldn’t have to drive across Arroyo Grande Creek to get to the recreation area. He argues (as does state parks) that the environmental damage that could occur if they built the staging area and an ensuing road that could get heavy trucks with campers and ATV trailers to the camping area would be prohibitive. The Coastal Commission wouldn’t allow it, he says, plus it would be expensive. State parks completed two separate studies of alternative access areas in 1991 and 2006. It submitted both to the commission. And both concluded that keeping things the way they were made the most environmental sense. The Coastal Commission is asking that state parks conduct yet another study. 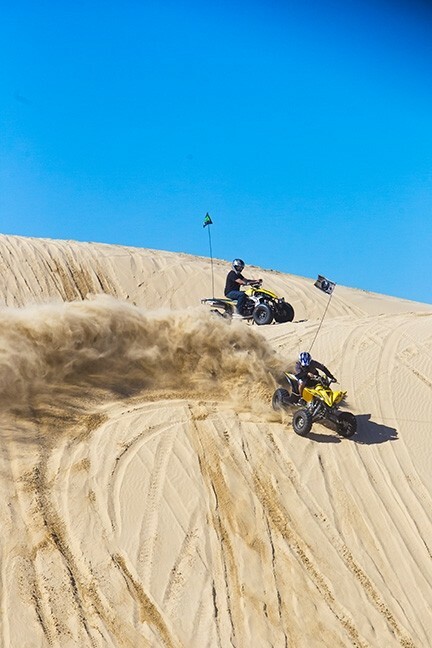 As avid of a dunes rider as Lalanne is, he still thinks that state parks should comply with the conditions of the permit issued by the Coastal Commission. 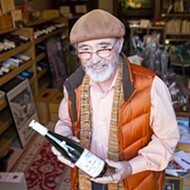 In a sense, he says, he sort of agrees with some of the people who are frustrated and upset. And if that creek crossing is such troublemaker, Lalanne wonders why the park hasn’t addressed the issue yet. He says something as simple as buying a portable bridge to utilize when the creek is running could solve the problem. Plus, riders wouldn’t lose anymore space than they’ve already lost. Larry Bross, who lives on Strand Avenue in Oceano with the state park in his backyard, said he’s not going to bet anything changes anytime soon. Bross has been battling against dunes-usage issues since before 1982, when the park got its coastal development permit. The beach cabin he bought more than 40 years ago is now a beach house, and while the beach he stares at through his back windows has always had vehicles on it, things have changed. 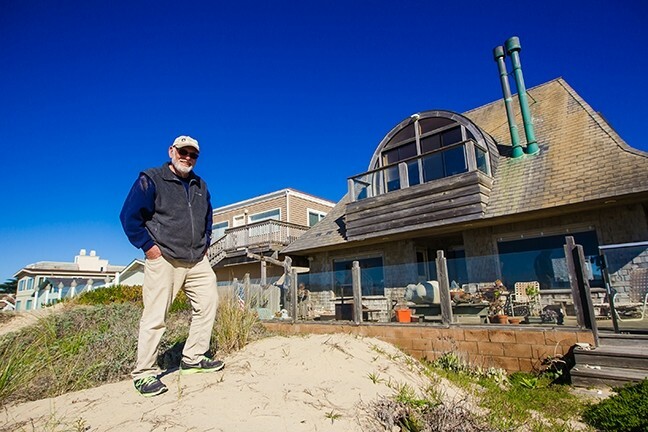 RESIDENT ACTIVIST: Larry Bross, whose backyard is the Oceano Dunes state park, doesn’t want people driving on the strip of beach that runs behind his neighborhood in Oceano. That was before state parks officially made it the Oceano Dunes State Vehicular Recreation Area and shut down vehicle access to Pismo Beach. Bross believes that without local park rangers, “this place would be crazy,” and he credits them for doing what they can to protect the resources they have. During the week, things are quiet, both in the neighborhood and on the beach. Families with kids come and stay in neighboring vacation rentals on the weekends and during the summer. Bross has a hard time with the concept of kids running down to the beach from the neighborhood as vehicles are driving on the sand. He doesn’t necessarily take issue with vehicles on the beach or in the dunes, he just doesn’t want driving allowed in front of his neighborhood, which ends just before where Arroyo Grande Creek meanders out to the Pacific. He believes that state parks should put a permanent entrance to the dunes farther down the beach somewhere—one with direct access to the camping area. 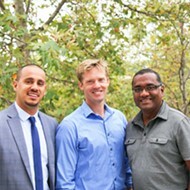 That, he said, would also take care of the environmental issues with the creek.